The new VSKA rifle, now available with a synthetic stock and handguard! Re-engineered with critical components using machined S7 tool steel, a material so highly regarded for it's ability to withstand heavy duty action that it's used in excavator teeth and jackhammer tips! The VSKA rifle features an all new bolt carrier, front trunnion, and feed ramp machined from S7 tool steel and specially heat treated for maximum durability. S7, often referred to as a “Shock-Resisting Tool Steel,” is commonly used for tools like chisels and jackhammer tips as it has maximum shock resistance and high compression strength, while retaining toughness. The front trunnion and bolt are machined from billet and exceeded the durability goals for the project. 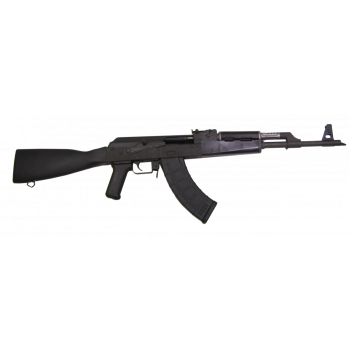 Additionally, the VSKA features a carburized 4140 steel bolt, a chrome-moly 4150 barrel, and sports the RAK-1 Enhanced Trigger Group for an impressive trigger pull. Along with a manganese-phosphate finish, Century adds a little style to the heavy-duty brute with an American Maple wood buttstock and forend. What is the advantage of a carburized bolt? The carburized bolt is case hardened to a higher hardness while maintaining sufficient ductility in the core. This bolt benefits from a lower coefficient of friction in the carburized surface which reduces the potential for galling and plastic deformation. How durable is the trunnion? Production of the VSKA was approved when a sample of rifles were each test-fired to 12,000 rounds with zero trunnion failures and headspace remained within SAAMI 7.62x39mm specification for every gun. The “S” in S7 stands for “Shock Resisting”. This is an extremely durable tool steel widely used in demanding applications such as excavator teeth and jackhammer tips. How did Century Arms create a test plan for the VSKA? The test plan was adapted from the U.S. Mil TOP 3-2-045, Reliability and Durability for Semi-Auto Fire qualification. Does Century Arms abide by a recognized quality standard? Yes. Century Arms became ISO 9001:2015 Certified in July of 2018.